The date- April 15, 2018. The weather-15 inches of snow due to fall by the end of this day. The dilemma—Do I move the gilded mirror measuring 39" by 54" and weighing over 40 pounds from my sister's house to ours? I had delayed responding to the question—do I want this family heirloom—for a year and now Meryll was moving the next day.This forty pound heirloom seemed so much weightier than its forty pounds. I had many conversations with my husband about the mirror over the course of the year. Unfortunately, all of them were in my head until two days before the deadline. The conversation went just as I had predicted in my head. Me: Meryll would like me to have The Mirror if I want it. Harry: But do you want it? Me: I don't know. It was Grandma Myrtle's. Harry: But do you want it? Do you want it just because you feel like you should want it? [Wait, who's the psychologist in the family?]. Me: [diversion technique] - I found the perfect place for it. Harry: Why didn't you talk to me? Leslie: I did.I had lots of conversations with you, and you were very obstructionist about the whole thing. Harry: This is the first conversation we've had about it. Marie Kondo, High Priestess of clearing our space, suggests that we thank our belongings for taking care of us before we get rid of them. I understand that this derives from the Shinto belief that all things have spirits according to the kinds of energies that humans imbue in them.What does that mean when contemplating accepting a family heirloom? Should we consider the type of spirits already contained in that object before welcoming it into our home? This was my dilemma. I researched The Mirror's origins with my mother, who believed that her parents had purchased it in the summer of 1937 when my grandparents moved their expanding family into a gracious, new home. 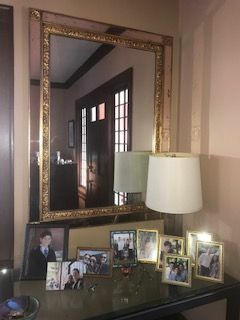 Originally mounted in my grandparents' formal dining room, the mirror would have reflected the public face of my family as they sat down to Shabbat dinner and the warmth of the Shabbat candles. The extended family would gather and talk about the family business, the synagogue, relatives, and local gossip. The Mirror could remind me of the stability and sense of belonging I had.I grew up about four blocks from my mom's old house and attended the same elementary school. There were nine "cousins" in my graduating class of fewer than 200. Our synagogue was a place where I could see portraits of my great grandparents, founders of the synagogue.My grandparents' wedding was the first one performed there. Like every family, there is a more complicated side that didn't show up in family photographs but would have been captured by The Mirror. It would catch my mom as a little girl carefully walking through the house, tiptoeing when her father was home and staying quiet and out of sight. It would reflect Maddie, the African-American cook, housekeeper and nanny on her feet all day entering the dining room to set the table or bringing something on command when Grandma pressed the silent butler bell on the floor. The Mirror would reflect the passing looks of fear and acquiescence as my grandfather conducted the orchestra of his family's mood, demanding their attention and adulation. My mom and her brothers grew up and the house was emptied. My grandparents moved to their new contemporary home and little more was reflected in this mirror than the porch and the gardens beyond, except when the grandchildren came to fill the room once again on Shabbat. Maddie was replaced by the silent, frightened, thin Frances, whom I now recognize as an adult with a childhood history of horrible neglect. The reflections were still muted as everyone was on their best behavior in the house saving the laughter and raucousness for the pool.The dining room remained empty most of the summer and fall of 1972, the year my grandmother died. Soon after, my grandparents' house was sold, and The Mirror went to Meryll's Minneapolis home and recorded the life cycle of her family. Two generations later, Shabbat dinner continued at my grandparents dining room table with The Mirror recording the devotion to tradition. Now my grandparents' great-great grandchildren are sitting at that same table. One paragraph and lifetimes elapse, but The Mirror sees it all. I didn't really make a decision.I just proceeded.The Mirror needs to continue to be part of our family and yes, it would see the joy and the tears that are part of every family. Harry wasn't going to participate in my ordeal and I understood because his back hurt. So I took my trusty neighbor, Maddie, a ninth grader and off we trudged in the snow to pick up this historic Mirror and drag it to the house. The Mirror was placed near the entry and I turned it vertically, so it would have a new perspective and I would shake up the karma a bit. It would also welcome everyone into the house. As I hung it, I expressed my gratitude for the memories it contained – good and bad- that have influenced the life that I have today. The Mirror will know everything. Only the grief will be hidden when a cloth protects it during shiva. I hope that The Mirror will absorb good energy in our home. I now welcome the preserved memories of the complex emotions of each family's life undistorted by romantic filters. Marie Kondo, it can make me happy. I'll keep it .I am determined I can hold the historical weight, and I hope to add memories that may lighten its soul. And it will eventually be time for the mirror to be passed on. I'm grateful to the mirror for reminding me that all of us reflect all the generations that came before; and, that I too, am just passing through. We all do the best we can, and what I hope it can record most is our deep love for each other and the embraces of greetings and partings that we face in our lives. 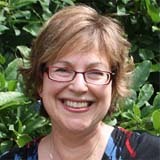 Leslie Levine Adler, PhD visited Russia in the summer of 1976 as part of her undergraduate Russian Studies program. She returned in 1977 to pursue her friendships from the previous summer. After teaching ESL at university, she became a psychologist. We were featured speakers at Hadassah Brandeis Institute and Levy Summer Series. Our speaking engagements include JCCs, synagogues, libraries, book groups, retirement communities, schools, and organizations (e.g. ORT, Hadassah, and Women's League). References are available. 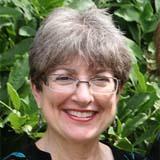 "I was very fortunate to be able to hear Meryll and Leslie speak at a Hadassah event in Israel. Each of the ~50 participants really enjoyed the event because Meryll and Leslie were so engaging. While they had a natural rapport with the audience, you could also tell they had prepared well so they could connect with our particular group's interests. I learned a lot from listening to them, and I found their sisterly interaction unique and fun. If you want an enlightening and uplifting experience, attend one of their book talks." 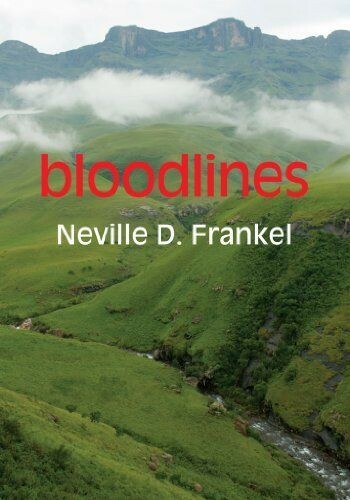 "Truly, you have written a story that makes accessible the reality of existence in Russia, through the eyes of individuals who lived through the various regimes and dictates. It is fascinating and very well told. As I read Vera and Alla's story, I learned more Russian history than I had known from a textbook. That's a big deal, women! You tell the tale with vivid detail and hook us on the two women and their stories, then weave in the history to illuminate their journeys. It is such a necessary book. I am thrilled that the two of you collaborated, as I can see the uniqueness of your personalities come through in the stories, and that, too, makes the book a gem." Click here to order your copy of Jewish Luck: A True Story of Friendship, Deception, and Risky Business on Amazon.com. Make a donation to Sholom Home and enjoy Jewish Luck at the same time. Jewish Luck is now available at the Sholom Home West gift store. Meryll and Leslie will donate 50% of the proceeds back to Sholom Home. Enjoy! Nourish mind, body, and soul with Meryll's Tasting Torah, which will bring oneg (joy) and limmud (learning) to your Shabbat, broaden your culinary horizons, and draw your Shabbat guests closer together.